Earn up to 4,200 reward points. 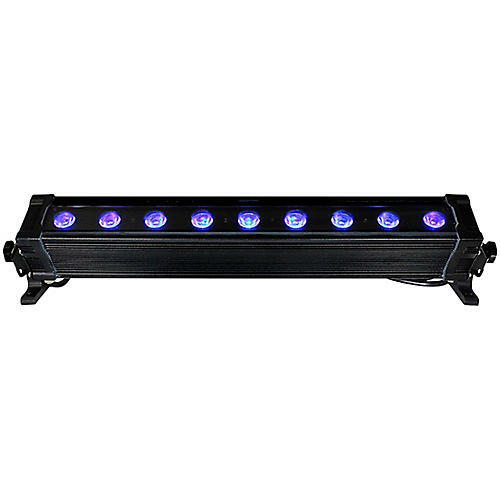 With an IP65 rating for outdoor use, this wash bar fixture boasts smooth RGBAW+UV color mixing from an array of nine powerful 15W LEDs. With such a wide range of rich, saturated colors at its disposal, the ToughStick EXA can produce the precise color—and brightness—for the mood you want to set. From bright, exciting primary colors to atmospheric ultraviolet light, this fixture has it covered. The weatherproof 4-button LED control panel found on the side of the ToughStick EXA gives users full control of all the features and settings such as full RGBAW+UV color mixing, 35 built-in programs, strobe and speed controls, plus sound active mode. But if you prefer to have more control over the ToughStick EXA, the LED panel also gives you the ability to set the DMX operation parameters. The ToughStick EXA’s control panel isn’t the only thing that’s weatherproof—the fixture’s IP65 outdoor rating means every part of this wash light is designed to perform under any weather conditions and stand up to demanding professional use. From IP-rated power and DMX connections, to rugged aluminum housing and tempered glass top, the TouchStick EXA is up to the challenge. Thanks to the TouchStick EXA’s 32-bit, flicker-free dimming circuitry, you can choose from five different dimming modes. Each mode allows different amounts of steps, offering smoother and slower dimming. This rugged linear wash light delivers RGBAW plus UV in any weather—order now.